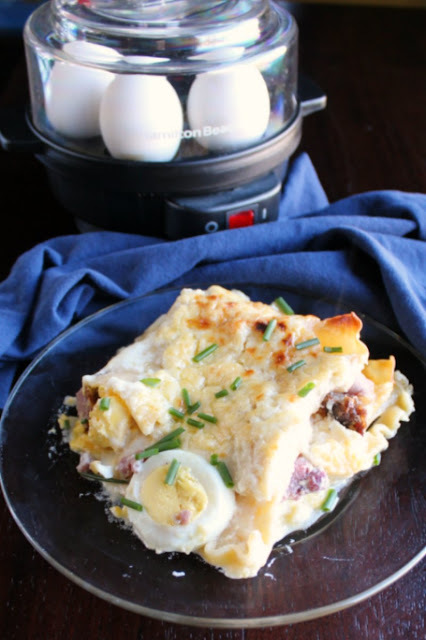 Croque madame inspired lasagna is perfect for breakfast, brunch or dinner. 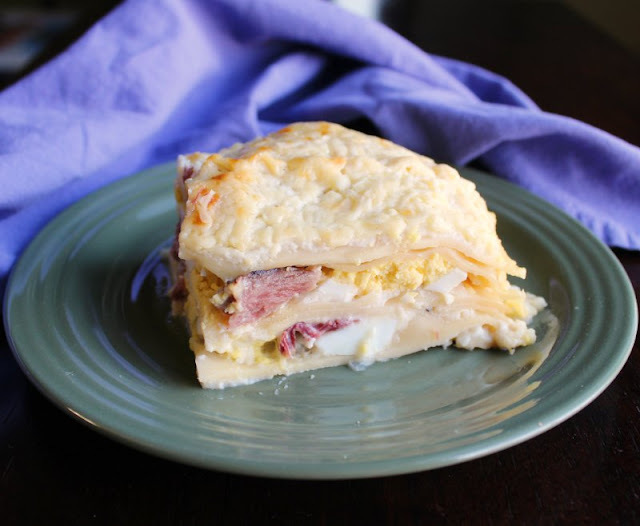 Bonus: it's also a great way to use leftover ham and hard boiled eggs from Easter! 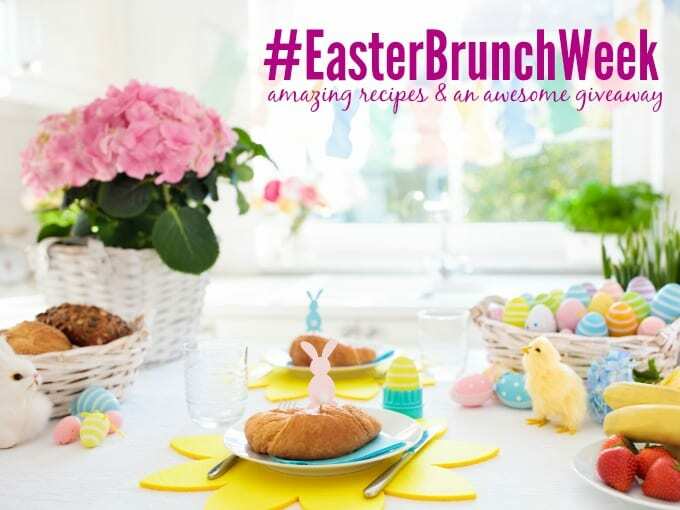 This post is sponsored in conjunction with #easterbrunchweek #ad. I received products for recipe development and there are prizes you can win. As always all opinions are honest and my own. 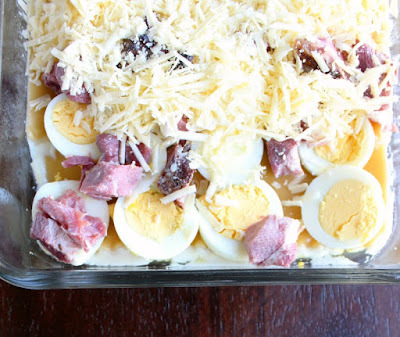 Layers of creamy Dijon spiked beschamel with pasta, ham, eggs and cheese. 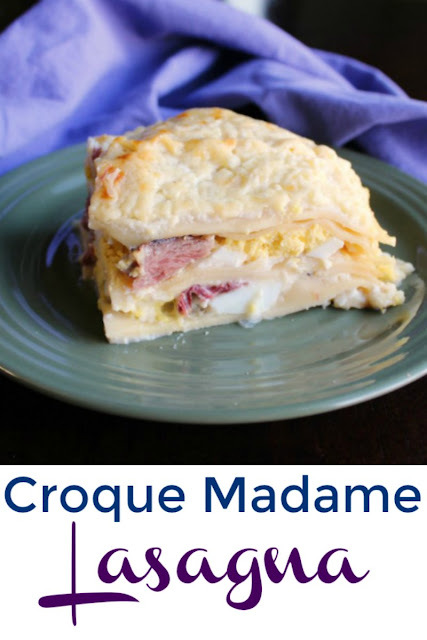 It is a luxurious and fun twist on the classic French sandwich. It is hearty, delicious and can be assembled ahead of time too! I'm about to let you in on a little secret. It's a little embarrassing, so let's try to keep it between us. I've never actually had a croque madame. It's true. I'm glad I got that off my chest. But that doesn't keep me from loving the combination of flavors. It just means there are no French bistros in my neck of the woods and I haven't made one for myself yet. Instead I have made a nice little portfolio of options inspired by the sandwich. There's the croque madame pizza that is absolutely delicious. Or if you are looking for a more elegant brunch option, there's the croque madame waffle. It is easy to make in batches, so a perfect option for Easter or Mother's Day brunch. Now I am adding lasagna to my repertoire. This is a great assemble ahead version that can be baked off whenever you are ready. There is also the added benefit that it uses some of the ingredients a lot of us are about to have in spades. If you have never spiked your beschamel with Dijon mustard, you are missing out. I am not a huge mustard fan, but it was love at first bite for me. 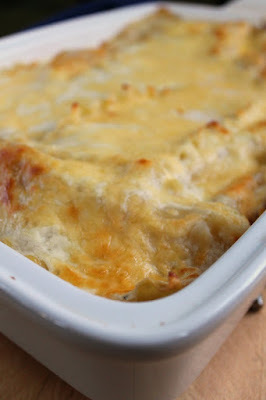 The creamy sauce is the perfect base for loads of melted gruyere and ham. Yummmy! In order to get the egg portion of the croque madame, I decided to go with hard boiled eggs. That allowed me to use some of my stash while also keeping serving easy. 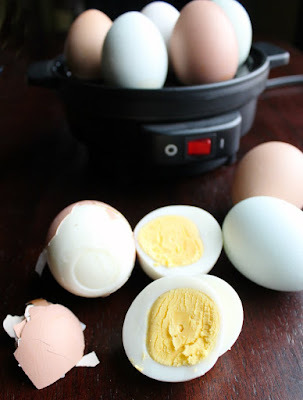 I used my new Hamilton Beach egg cooker to get the perfect hard boiled eggs. That thing is going to come in handy when it's time to prep eggs for dying eggs too! If you are a runny yolk person like me, don't despair. I have an option for you too. Just make a croque monsieur version of the lasagna without the eggs. Then top a slice with a perfectly poached egg. Don't worry, the egg cooker has an insert for that too. Just add the correct amount of water and the machine will buzz when the yolk is cooked to your liking! If you don't have leftover ham around, slices of ham lunch meat work too. I made this several time and have used both with yummy results! Have you ever made a breakfast lasagna? I'd love to hear about it along with your best tips for using up Easter leftovers. Easter Brunch WeekThis week, we're sharing loads of Easter recipes and celebrating the upcoming holiday with an amazing giveaway, sponsored by Eggland's Best, GROSCHE International, Hamilton Beach, Nordic Ware, Rhodes Bread, Silpat, Stonyfield and Wewalka. You can read more about these awesome sponsors HERE. Official Rules and Conditions for the #EasterBrunchWeek Giveaway: One grand prize winner winner will be receive a prize package including items from Eggland's Best, Grosche, Hamilton Beach, Rhodes Bread, Silpat, Stonyfield and Wewalka. Open to US residents 18+. One (1) winner will be chosen. Prize must be claimed within 48 hours of announcement or a new winner will be drawn. Prize will be delivered electronically. All entries will be verified. This giveaway is in no way associated with Facebook, Pinterest, Twitter, Instagram, Rafflecopter, or any other entity unless otherwise specified. Giveaway ends 4/20/2019. Enter using the widget below. Comment each day for even more chances to win! Preheat oven to 350 F and grease a 9x13" pan. In a large skillet or saucepan, melt the butter. Add the flour and cook over medium heat for a minute or two, stirring frequently. You don't want it to take on color, just cook the flour flavor out. Slowly pour in the milk while stirring. 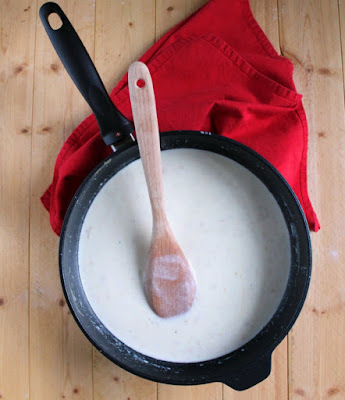 Continue stirring frequently until the mixture starts to bubble and thicken. Season with salt and pepper and stir in Dijon mustard. Meanwhile, cook the lasagna noodles to al dente according to the directions on the box and drain. Spread about 1/4 of the sauce on the bottom of the pan. Then put a layer of 4 lasagna noodles. Top 1/4 more of the sauce and half of the ham and sliced hard boiled eggs. Sprinkle with 1/3 of the cheese. Repeat that layer using 4 more lasagna noodles, 1/4 more of the sauce and the remaining ham and eggs and a bit more cheese. Allow to sit for 10-15 minutes and then serve. I love the idea of having the poached egg on top. Yum!! I usually just do ham and a potato thing with a vegetable. 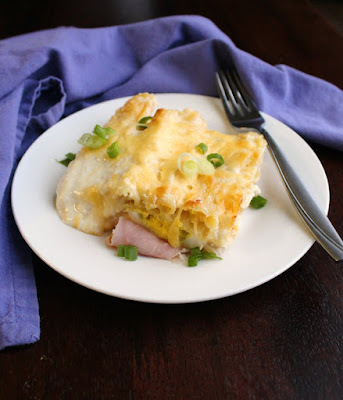 This recipe will be great for that leftover ham! Thanks!